Daily 9:00 a.m. - 10:00 p.m. Located just outside downtown Manteo on beautiful Roanoke Island, the 27 room Dare Haven Motel may well be the best value around the Outer Banks. Cared for by the Williams family for generations, you could say that we are the definition of family owned and operated! At the Dare Haven Motel, we pride ourselves on quiet, clean and comfortable accommodations at prices that won’t break the bank. Whether you are traveling alone or bringing the whole family, we have the room (or rooms) for you. Both single and double options are available in a variety of configurations, and we have rooms for Fido too! All of our rooms — many of which have been recently updated — come fully equipped with all the conveniences and comforts you would expect, including refrigerators. They come with some unexpected perks too, like close proximity to the area's best restaurants — Lost Colony Brewery and Cafe, Ortega'z, 1587, Poor Richard's and Stripers Bar and Grille, to name a few. Our on-site lot offers ample room for parking, while also providing space for boats and trailers. 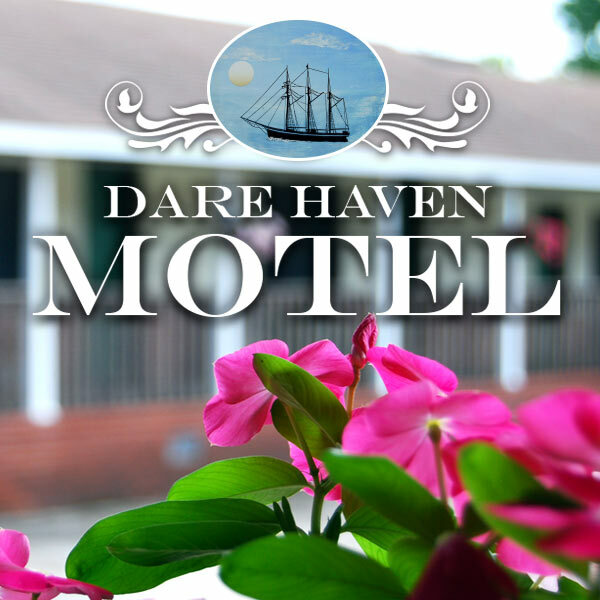 The Dare Haven Motel's central location is convenient to the Lost Colony, Fort Raleigh, downtown Manteo and just about anywhere on the central or southern Outer Banks. As long-time locals, we are always happy to provide guests with recommendations on area restaurants, attractions and shopping destinations. Since the motels founding, every generation of the Williams family has served in the U.S. Military, proudly representing all five branches. As a thank you to the men and women serving in the U.S. Armed Forces, the Dare Haven Outer Banks Motel offers a 10% military discount with valid military ID. All of us at the Dare Haven Outer Banks Motel would like to extend a special thank you to the Blue Knights, a law enforcement motorcycle group, who have visited the Dare Haven Motel annually for over 25 years! The Dare Haven greatly appreciates all of our loyal customers and friends. Bikers, fisherman, boats, hunters, families and pets are always welcome! Not to be confused with the closed Duke of Dare Motel, the Dare Haven Motel is located just north of Manteo Elementary School. We look forward to hosting you at the Dare Haven Motel in Manteo.